Located in picturesque downtown North Creek, NY. 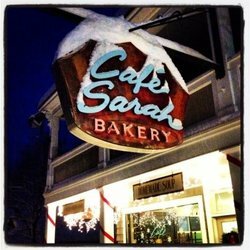 Cafe Sarah serves breakfast and lunch daily. Always offering a delicious array of fresh baked cookies, muffins, breads, sandwiches, homemade soups, pies, tarts, and cakes. All handmade that day! Natural, organic, and locally-sourced ingredients are used as much as possible. No preservatives. Cafe Sarah specializes in beautiful cakes for your special occasion or event.